HDR10 vs Dolby Vision: which is better? | What Hi-Fi? HDR TV is the battleground in the latest technological format war. We put two of the frontrunners, HDR10 and Dolby Vision, to the test. By this point in 2017, you probably know you want HDR video in your life (assuming you haven’t got it already), but there’s still much confusion out there regarding the different HDR formats. We’re going to put Hybrid Log Gamma (HLG) and Advanced HDR by Technicolor to one side for now (mostly because neither is particularly prevalent at this point) and focus on HDR10 and Dolby Vision. HDR10 is comfortably the most common HDR format currently available, while Dolby Vision is rarer - but, on paper, it's more advanced - and should deliver even more stunning pictures. The reason Dolby Vision looks set to take HDR to the next level is because it adds dynamic metadata that carries frame-by-frame instructions. A Dolby Vision-capable display can then use this metadata to make sure it portrays the content as accurately as possible. Dolby Vision-capable TVs combine the frame-by-frame information received from the source with an awareness of their own capabilities in terms of brightness, contrast and colour performance. Unlike HDR10 video, Dolby Vision content is essentially being optimised for your TV on the fly, theoretically delivering the best possible image in every scene. That’s the idea anyway, and until recently it - plus a few manufacturer demos - was all we had to go on. Now, though, we’ve been able to compare Dolby Vision and HDR10 directly in our own testing rooms – and the results are surprising, to say the least. But first, how did we conduct the test? It’s certainly not an easy comparison to make, because Dolby Vision TVs are still very rare and because those TVs don’t allow you to switch between Dolby Vision and HDR10. Both points also apply to Blu-ray players - and Dolby Vision discs are still rarer than a blue steak. But where there's a will, there's a way. We sourced an LG OLED65G7V (all of LG’s 2017 OLEDs support Dolby Vision) and two Oppo UDP-203 Blu-ray players. We updated one of the Oppos to the latest firmware, which adds Dolby Vision support, and left the other on earlier firmware, limiting it to HDR10. Finally, we bought two copies of the Power Rangers and Despicable Me 4K Blu-rays - not because they’re fabulous films, but because they’re two of very few discs available with Dolby Vision support (others available include the Despicable Me sequels, The Fate of the Furious and Transformers: The Last Knight). With this kit we are able to connect the two players to the LG TV simultaneously, play the two discs concurrently, and flick between inputs for instant comparisons of Dolby Vision and HDR10. We’ve got both inputs set to the Cinema Home preset, which is the default mode when a Dolby Vision signal is detected but has to be manually selected when playing standard HDR10. We’re not saying this is a perfect test scenario: there could be small manufacturing differences between the Oppo players, and the more recent firmware may have added small picture differences beyond the addition of Dolby Vision. But comparing an HDR10 disc on the two players delivers a picture that's to all intents and purposes identical and, even taking these caveats into consideration, the results are really rather interesting - particularly in the case of Despicable Me. Let’s get the headline surprise out of the way now: the Dolby Vision version of Despicable Me, when tested using the kit and method outlined above, looks inferior to the HDR10 version. The HDR10 version of the film is bright and punchy, with the kind of contrast that adds definition to objects and a real sense of three-dimensionality. This is a vibrant, exciting picture that draws the eye and makes the film look genuinely spectacular. The Dolby Vision version is quite pale and flat by comparison. The distance between the bright and dark elements of the image seems significantly shorter, and that relative crushing of contrast leaves colours and shades blending into one another. Objects and characters simply stand out less distinctly. It’s a more subdued image, which is not what we were expecting. It’s worth pointing out we’re generally using the default Cinema Home settings, as we believe that’s what most people at home will do (after all, the raison d’etre of Dolby Vision is that you’re seeing the most accurate image possible) - but we do also spend a long period attempting to get the two images closer to one another, to no avail. Switching both inputs to the Standard preset produces a brighter, more vivid image across the board, but there still remains a significant gap between Dolby Vision and HDR10 - in favour of the latter. When we first published this comparison back in August it essentially ended here, as Despicable Me was the only disc at our disposal. Thankfully (and we use that word advisedly), we now have two copies of Power Rangers, and it’s a complete turnaround for Dolby Vision. Yes, the film is utter garbage, but it’s also jam-packed with testing scenes and it looks great in both formats. Play it in HDR10 and the image is crisp, clean and colourful. The silly suits are vivid and vibrant, the lights of the Morphing Grid shine brightly against the dimness of the rest of the Rangers’ lair, and there’s plenty of detail in both dark and light portions of the picture. It’s a very impressive picture, and a massive step-up from watching the film in standard dynamic range. But in Dolby Vision it looks even better. Car headlights shine brighter against a dusky landscape, more detail is revealed in night-time landscapes and cloudy skies, the twinkling of stars against the blackness of space is even more pronounced and dramatic, and those suits (have we mentioned they’re ridiculous?) are even more vibrant. In short, these are across-the-board improvements - and while each is in many ways quite small and subtle, the overall impact is clear to see. 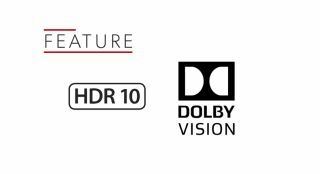 We still feel it’s a little early to draw absolute conclusions (a sample size of two movies isn’t nearly big enough), but what is clear now (and certainly wasn’t before) is when it’s implemented correctly, Dolby Vision can produce marked improvements on an already-impressive HDR10 presentation. The Dolby Vision version of Power Rangers is even punchier and more vibrant than the HDR10 alternative, but there’s also more nuance thanks to the extra detail that’s revealed in the brightest and darkest areas of the image. It’s not utterly transformative, but it is quite clearly better. Dolby Vision is applied on a disc-by-disc and frame-by-frame basis, and it could well be that Despicable Me just isn’t a particularly good example of its implementation, while Power Rangers is more typical of what we should expect from the format. We can’t yet be sure, though, and the worry is that Despicable Me might not be the only disc with poorly implemented Dolby Vision. The only sure way to find out is test each one, and we’ll be doing our best to do just that over the coming weeks and months. We’ll be sure to update this comparison as soon as we’ve got more to report.